With our engine issues resolved for the time being, we were eager to spend some time away from the dock. A Ferrari doesn’t do much good sitting in a garage and Small World was built to sail. 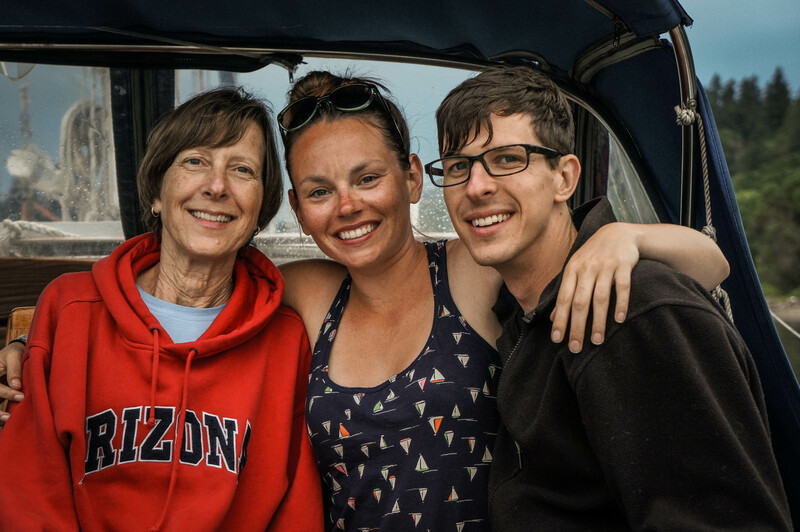 Craig’s mom (aka Marna, aka Momna, aka Mama Grizz) had planned a visit to Seattle for the Fourth of July and we had been hell-bent on making sure that the boat was going to be able to join the fun on the water. Our destination for the festivities was Quartermaster Harbor, Vashon Island. Let’s pause for a moment and revel in the glory, shall we? 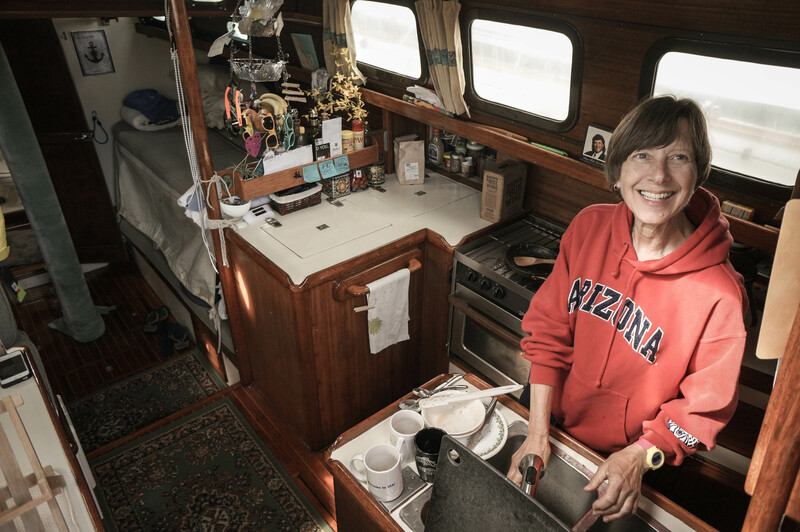 We had a destination in mind, a functioning boat, and enough comfort with the idea of leaving the dock that we were finally going to be “out there” for more than a day sail. Holy shitfuck!! It had taken a full year (almost to the day) since moving aboard Small World to get to this milestone and I think we were both sweaty-palmed with excitement and nervous anticipation. 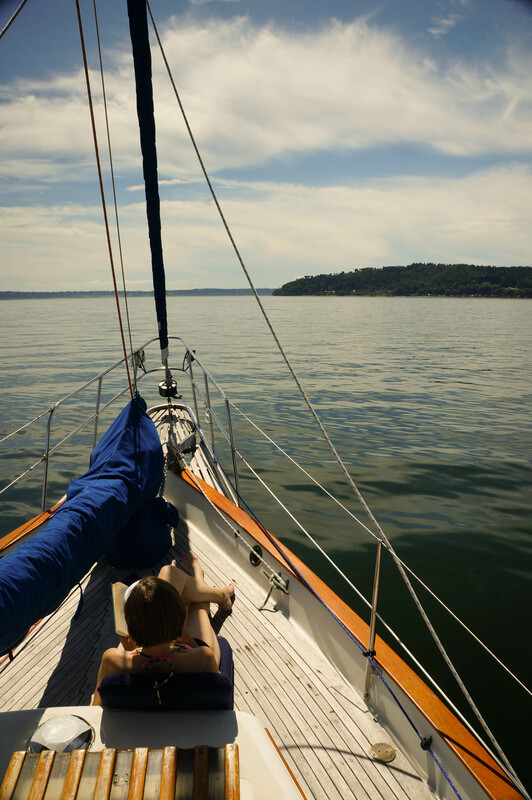 Our “sail” south to Vashon relied heavily on our now trusty blue diesel workhorse. We motored the entire trip and had to pinch ourselves more than once when we realized that we were putting miles under the keel. Without so much as a hiccup. Mama Grizz lookin’ mighty comfy at the helm. We had beautiful, sunny weather as we made our way down Puget Sound. And we had overcast, chilly weather as we pulled into Quartermaster Harbor. Lucky for us our entire wardrobe is always within 42 feet of us! Our arrival into Quartermaster Harbor was met with a minefield of crab pots. It was the opening day of crabbing season. The poor fools never stood a chance and we feared the same was true for us. I drove like a little old lady through that harbor entrance: white knuckled at a snail’s pace. I’m pretty sure that’s the first time in my driving history anyone has accused me of driving too slowly. But the idea of wrapping one of those crab pot ropes around the prop was enough to cause heart palpitations. I could see the whole scene play out in my head. First, the terrible noises come from the engine and we lose speed and steerage. Then we start drifting aimlessly through the minefield, collecting more and more crab pots and creating a hazard for the parade of boats that are filing into the harbor behind us. Craig didn’t need another repair item on the list and I didn’t need that kind of embarrassment. We finally made it through the channel into the harbor where we were supposed to anchor. Having been there once before on a different boat, I assumed there would be an abundance of space. I couldn’t have been more wrong. So we circled around and debated where to drop the anchor. This did not decrease my stress level. With so many factors to take into account and with so many eyes on us, it felt like the butterflies in my stomach were on a mixture of speed, meth, and crack cocaine. They had enough energy to clean my stomach and the boat. After what felt like an eternity, we settled on a spot and start to drop the anchor. It was history in the making! The first time we had ever dropped the anchor as the owners of Small World! Then a small little motor boat comes up to us, compliments our boat, and tells us we can’t anchor there since we are too close to the fireworks barge. They try to point out some orange markers that indicate the Off Limits Zone and we act like we can see them. I shout at Craig that we have to pull the anchor back up and find a new spot. (Just to be clear, we have to shout to be heard 30 ft. away over the engine, the anchor chain, and the wind. I’m not just being a jerk! Not always.) Suddenly, Craig is in the initial stages of panic (wild gestures, rapid mumbling, random curse words, shaking fists) while I try to look nonchalant at the helm. 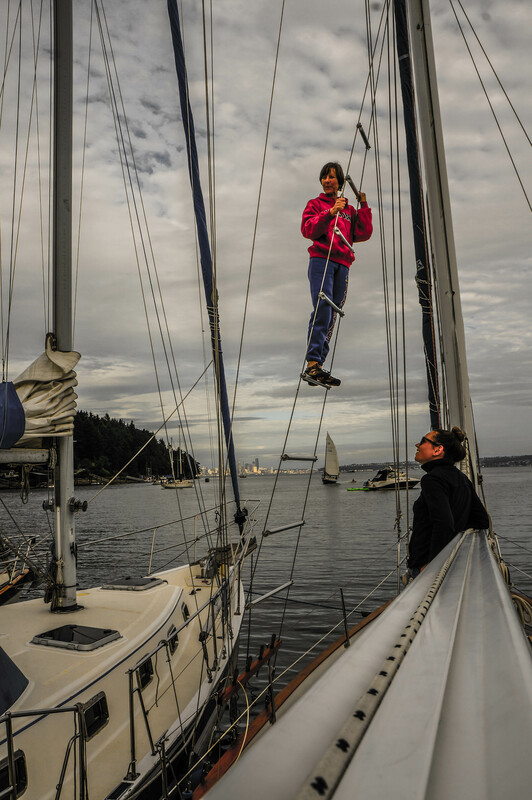 Marna acts as a transmitter and lets me know that the anchor will not come up. 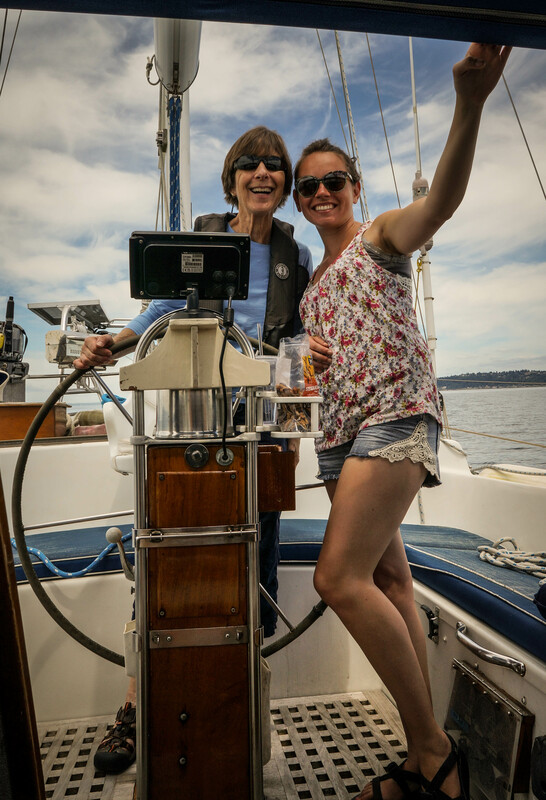 I leave Marna at the helm and try to help Craig at the bow. Another dinghy approaches us and tries to chat with us. He was a fellow Westsail owner who had found our blog (yay!) and didn’t seem to see the sheer terror on our faces as we tried to trouble shoot the issue. Of course this would happen the very first time we try to anchor. Of course it would happen when we are surrounded by other boats. Of course something would try to ruin this day for us. Our rescuers came by boat. The mighty Salty Swallow carried our friends Kendall and Jeremy and they had planned to meet us in the harbor. After getting a few good chuckles in at our expense, Jeremy tied his boat to ours and climbed aboard. Without the panic fogging his brain, he was able to help Craig get the anchor up. He went back to his boat and we went on to try and find another spot. Round two had us feeling significantly less confident and rather rattled, but we started to drop the anchor and put the engine in reverse. Only moments after we started the process, that little motor boat came back in our direction. I assumed that they weren’t coming back to give us more compliments on the boat, so I told Craig to stop lowering the anchor. I’m pretty sure the guys in the boat thought we were blind since we were apparently trying to anchor in the Off Limits Zone once again. For the record, I have great vision! Craig was able to raise the anchor on his own this time, despite the anchor chain’s best efforts to jam itself. By now, our dock friends showed up in their boats and we started to circle each other in a sailboat mating ritual. David Attenborough would’ve had a field day narrating the scene. We were circling, shouting, and gesturing as we tried to select a spot for all four boats to spend the night. Our parade of ketches headed well away from the fireworks barge to find some fresh onlookers to entertain. Lani set his anchor first. Never again! His boat has a fin keel, can spin on a dime, and can be steered in reverse. The same cannot be said for Phil’s boat or Small World. Phil tried to anchor in the opposite direction and meet up with Lani’s boat. 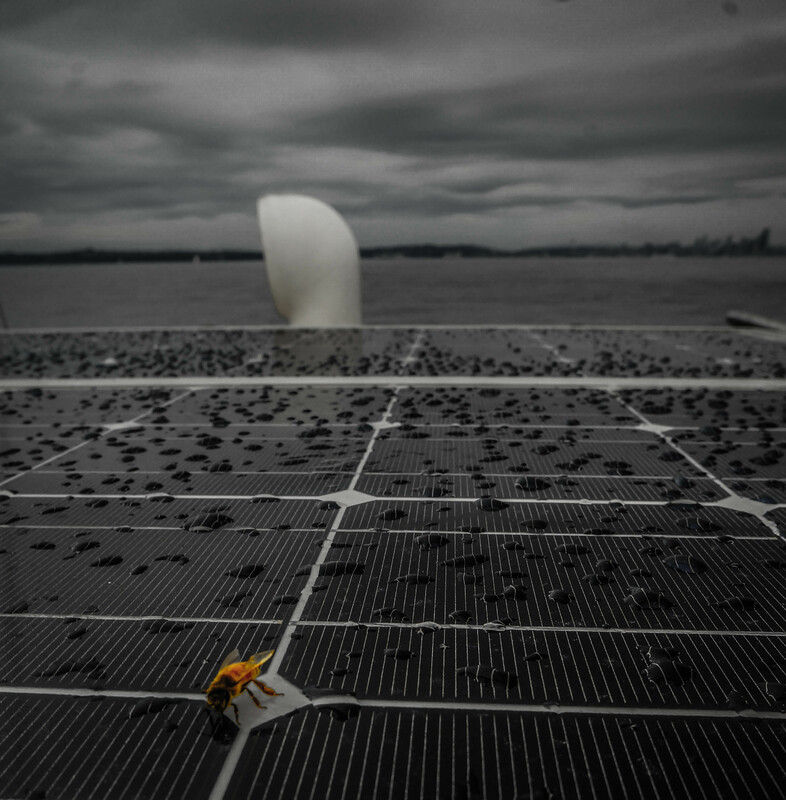 With the winds picking up and the growing crowd of boats, he never stood a chance. He gave it a great effort though! We puttered nearby and continued to add layers as the warmth of the sun dissipated. Momna asked for all the layers. And a beer. She said please. Before sunset, we had four sailboats and a power boat tied off, drinks in hand, and tried to put the stress behind us. 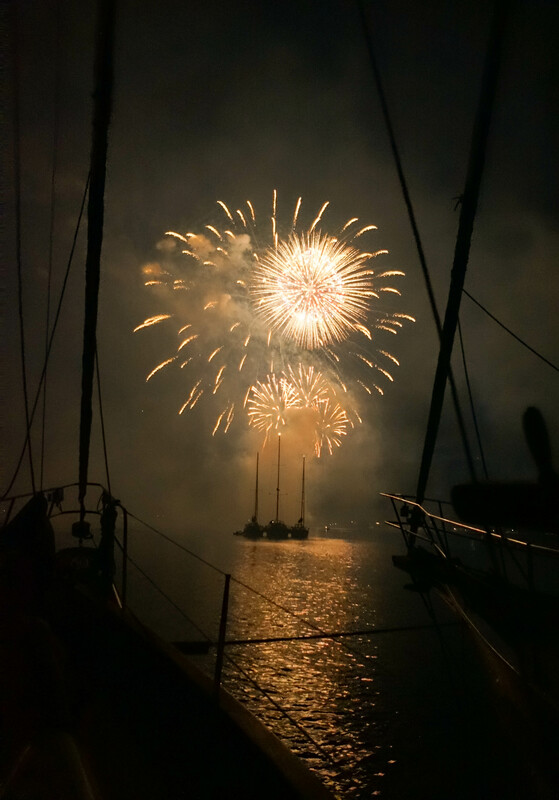 The evening ended with a spectacular fireworks show that almost felt like it was put on to celebrate Small World leaving the dock and spending a night away from the marina. The following morning found us in a sea of jelly fish. Never have I ever seen so many of them in one place. Our neighbor Kevin almost took a morning dip and was wise enough to check out the water first. It was mesmerizing to watch them all, and I felt a bit guilty when we fired up the engine. Their soft little bodies stood no chance against the spinning prop. That morning we decided that we had been having such a great time that we wanted to head to another anchorage for the night instead of heading back to the Shilshole. The trip to Blakely Harbor was slow going partially because of the crab pots, and partially because of the lack of wind. We wanted to sail, but the wind was fickle between the islands. Every time the wind picked up we would set the sails and then the wind would die down and we would have to strike them. The rain also made an appearance. A few times. So the sails went up and down and the rain coats went on and off. Overall it was a good trip and we all arrived safely. Mama Grizz, earning her keep. Momna, high above the salty sea. Small World, Balance, and Arvonna. 3 peas in a pod. Or harbor. YOU KNOW WHAT I MEAN!!! 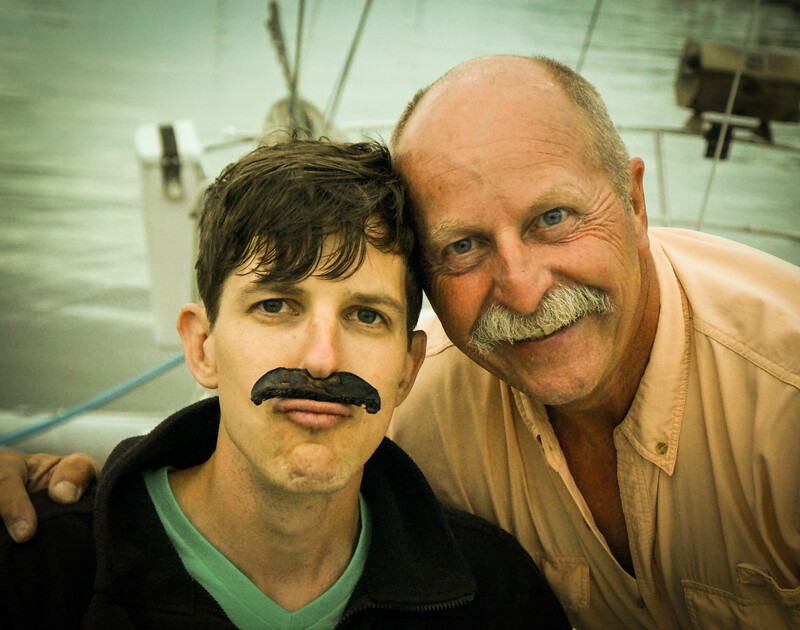 Portobello mustache. An homage to Lani. Lani hosted breakfast on deck in the morning and we all basked in the morning sun. It was not easy to cut loose from the raft-up knowing that work awaited me the following day. If I said I was tempted to make a run for it that would be an understatement. 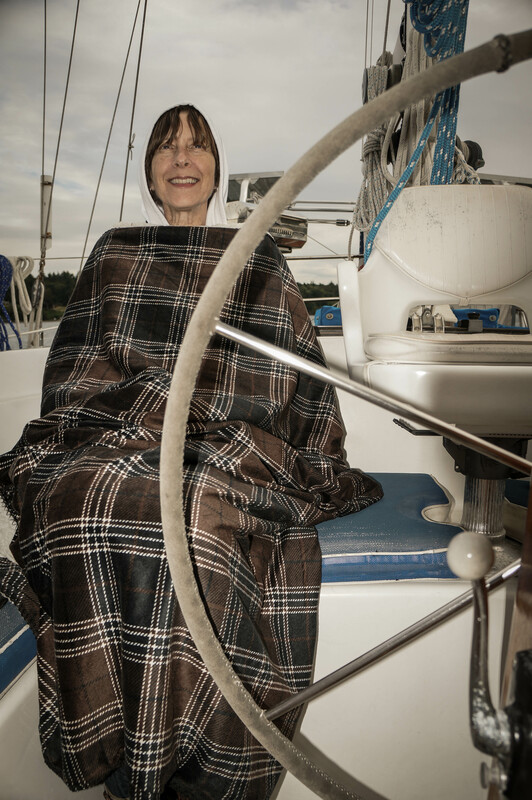 On the way home we were able to get some sailing in and Mama Grizz even got to steer. She kept us clear of other boats (including the ferry), and kept us on course. One point for Momna! We got Small World back into her slip and got everything cleaned up. Craig and I couldn’t stop smiling and everyone on the dock stopped by to congratulate us on getting the ol’ girl moving again. Even though we didn’t set our own anchor, we still counted the trip as a success. While some folks that have been doing this for a while have become well practiced, those of us in the Newb category find it daunting to move your home around and expose it to our lack of experience the elements. Momna, K, and C. What a bunch of studs. dear kraigle ~ i loved my small world adventure!! !